Serenade of the Seas is a beautiful Radiance Class cruise ship that can be found cruising (usually for 7-nights) from San Juan, Puerto Rico year-round in the Southern Caribbean. However, from May through October of 2012 this ship will be repositioned to Europe, sailing round trip from Barcelona on 12-night cruises. 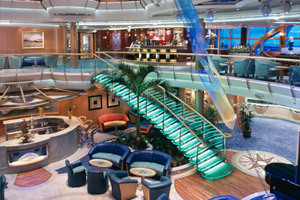 In December of 2012, Serenade of the Seas received a variety of upgrades. Among the enhancements were the addition of an outdoor movie screen, a few new restaurants (including Chef's Table, Giovanni's Table, and Izumi Asian Cuisine), pervasive Wi-Fi, flat-screen TVs in all staterooms, as well as a nursery, Concierge Club and Diamond Lounge. Upon entering the ship and seeing the impressive ten-story glass-constructed Centrum, with glass elevators facing the sea, you're sure to know that you're embarking on a wonderful "resort at sea." 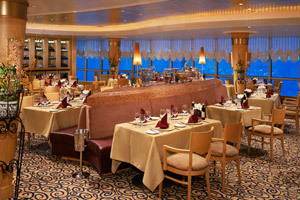 Among the many dining venues aboard Serenade of the Seas is Reflections, the two-tiered main dining room, as well as the Windjammer Café (with its various buffet-style dining options), a couple of upscale specialty restaurants (Portofino and Chops Grille, each which has a per person cover charge), Seaview Café, and a pizzeria. Also available is 24-hour room service, a great option for those that would like to enjoy a snack in the comfort and convenience of their stateroom or suite. 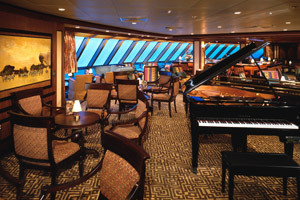 There are many entertainment venues and things to do on a Serenade of the Seas cruise. 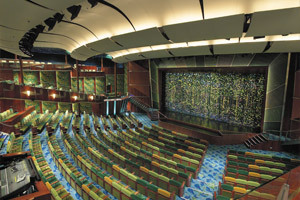 For instance, Tropical Theatre is the ship's three-level main show room, where a live performance occurs during each night of the cruise. Possible shows include Broadway-style production shows, comedians, magicians, acrobats, musicians and game shows. Also on this ship is a casino, swimming pools, whirlpools, mini-golf, a rock-climbing wall, full-service spa and fitness center, beautiful Solarium, duty-free shopping boutiques and internet cafe. 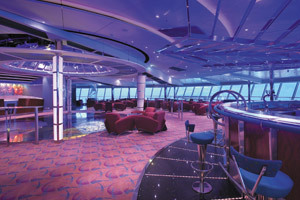 Of the ship's many bars and lounges, the Schooner Bar and Viking Crown Lounge are Royal Caribbean signature venues. Other options include Vortex Nightclub and the Colony Club, a British colonial-style lounge with self-leveling pool tables. If you're on a Serenade of the Seas cruise and are feeling lucky, you might want to check out the ship's large Vegas-style casino. Among the games available are Roulette, Craps, Caribbean Stud Poker, Blackjack, and a variety of slot machines. 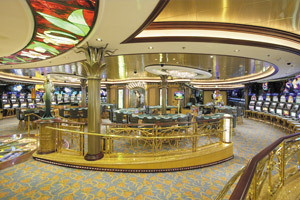 On a typical cruise there will even be a few gaming tournaments, such as Texas Hold'em. 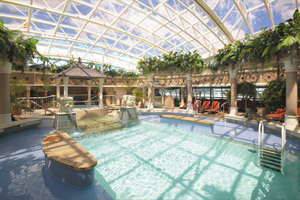 Like the rest of the Royal Caribbean fleet, there are great youth facilities available aboard Serenade of the Seas. There's a playroom (supervised by the ship's well-trained staff) filled with toys, books and games, as well as a teen-only pool and video arcade. Also on this ship is a sports court, where guests can play basketball and volleyball. 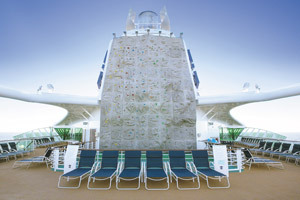 Those sailing aboard Serenade of the Seas have the opportunity to climb up the ship's large rock wall. It has a variety of paths, with different levels of difficulty to ensure that guests of all skill levels can have a great time. 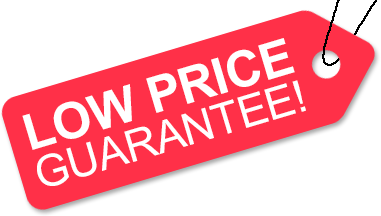 Low Price Guarantee on all Serenade of the Seas Cruises! Book any Royal Caribbean cruise with us and you'll get the best deal possible, regardless of the ship or sail date! Because of our "Low Price Guarantee," nobody beats our Serenade of the Seas cruise prices, so look around and you're sure to find the best Serenade of the Seas cruise deal possible when booking with us! Pre-Paid Gratuities on Serenade of the Seas Cruises! Serenade of the Seas Onboard Credit Sale! Get an Onboard Credit when you book a Serenade of the Seas cruise with us. The value of the Onboard Credit depends on the particular cruise and accommodations you book. Onboard Credit values are listed on Step 3 of the online booking process. We do not charge booking fees on any cruises! You're sure to enjoy an affordable Serenade of the Seas cruise when booking with us! Our special offers on Serenade of the Seas cruises may not be combinable. Certain restrictions apply to each offer. View terms and conditions during the online booking process. 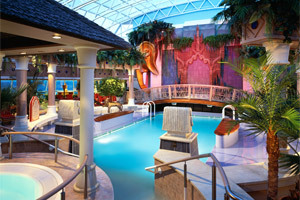 Click a price below to view the Serenade of the Seas cruises during that month in that destination. Two bedrooms with two twin beds that convert to Royal King (one room with third and fourth Pullman beds), two bathrooms (one with shower, one with bathtub), living area with double sofa bed, private balcony, and concierge service. Approximate Size: 584 square feet. Please note: Staterooms 8162, 8662, 8664, and and 8666 have partially obstructed views. Deck plans are subject to change. 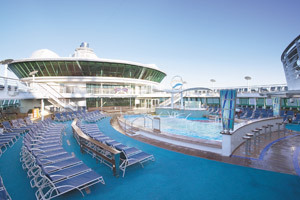 The deck plans of Serenade of the Seas provided on this page represent those through April 2017. For deck plans prior to or after this date range please contact Royal Caribbean directly. We reserve the right to correct errors. Please verify all information with the cruise line directly.